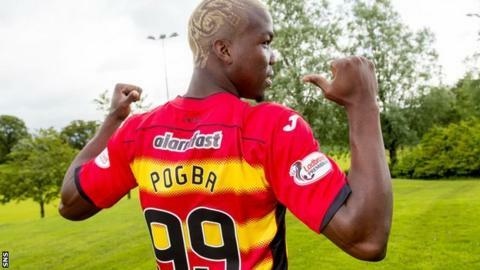 Partick Thistle's new signing Mathias Pogba - brother of Juventus midfielder Paul - aims to make a name for himself in Scotland's top flight. Pogba, 24, has signed a one-year deal. with the Scottish Premiership outfit. However, much like Dundee United's Rodney Sneijder, the striker knows he cannot be mentioned without reference to his more famous brother. "Definitely as a footballer you would like to be known as you, not as the brother of Paul," he told BBC Scotland. "Everybody has been talking about my brother, but now it would be nice to say 'OK, Mathias Pogba is here'." Pogba could have an immediate opportunity to make his own mark, with Thistle's upcoming league game this Sunday at home to Celtic. So what about the prospect of a winning debut goal on live television against the defending champions? "I pray to God all that could happen," he said. "It would be a very good debut for me and a very big game for the team and for me as well, as a new player here." As well as Paul, Mathias's twin brother Florentin is also a professional footballer, with St Etienne. Football, it seems, is in the Pogba genes. "All the time - 24/7 - when we were growing up, it was football. And still, it's my life," added the former Wrexham and Crewe striker. "When we were younger, Florentin and I were stronger, but Paul always had that something special, like he has now. "We are all proud of each other because we always talked about becoming professional footballers. We expected good work from him (Paul), but not as quick." Mathias is in daily contact with his brothers and aims to bring them to Firhill to watch him in action, as he seeks to underline the family's footballing pedigree.